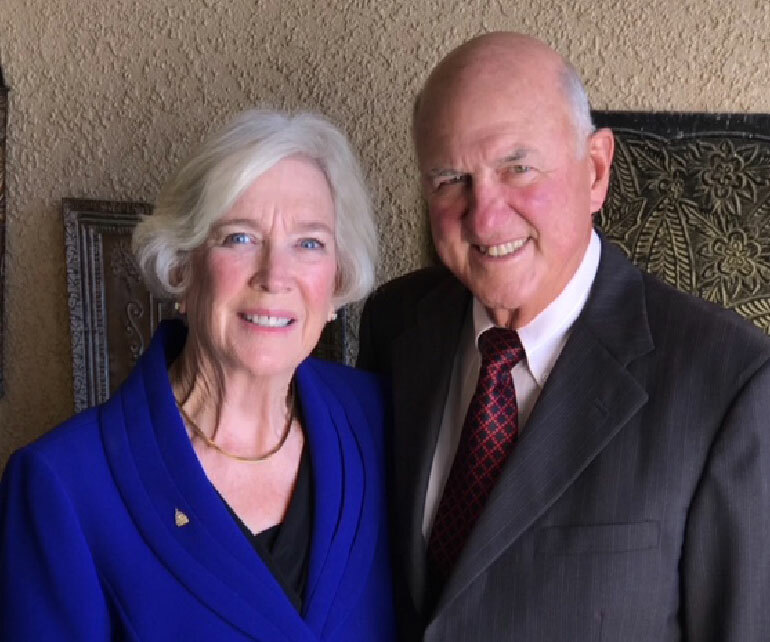 PUEBLO – William and Barbara Vidmar, long-time owners/managers of Vidmar Motor Co in Pueblo, will be honored with the fourth Lifetime Business Achievement Award from the Malik and Seeme Hasan School of Business (HSB) at Colorado State University-Pueblo on September 27, 2018 according to HSB Dean Dr. Bruce C. Raymond. A dessert reception and cash bar will open at 7 p.m. in the Foyer of the Occhiato Student Center Ballroom on the Colorado State University-Pueblo campus with the presentation to follow in the Ballroom at 8 p.m. The event is open to the public at no charge. Bill and Barbara Vidmar came from different parts of the country and from vastly different backgrounds, however were raised with similar values. They were encouraged to work hard, get a good education, and honor God, country and family. They both had immigrant grandparents who believed anything was possible in the United States of America and passed those beliefs on to their grandchildren. Bill was born and raised in Pueblo where he attended Catholic schools and was expected to work at the family’s car dealership and put up hay for ranchers in the summer as well as play sports and succeed in school. Barb came from the Pacific Northwest, growing up in a small town on the Canadian border, and learned the hard way about working outside in the rain whether it was working on her family’s holly farm or picking berries for farmers in the area. Reading at night or playing a musical instrument were family past times since there was no TV in her home. Bill and Barb met and married while in college and started their family before graduating from CSU-Ft Collins. Soon after their second child was born they moved to Pueblo where Bill was hired as a sales manager for Vidmar-Mathis Motor Co. and Barb began volunteering in the community. Bill immediately started buying Mr. Mathis’ shares in the company and when that was complete the name was changed to Vidmar Motor Co. Even in those early years, Bill served on several boards, Friends of the Library and Pueblo Country Club to name a few and Barb joined Junior League and Rosemont Museum Auxiliary. Bill was insistent about enlarging the dealership to include Honda as well as Jeep and Oldsmobile and was part of Jeep’s transformation that included four changes in manufacturing (Willys, American Motors, Renault, and Chrysler). By 1980 Barb was working alongside Bill, and when the dealerships expanded across Albany Ave she was named dealer principle of Honda while Bill managed the domestic lines. They both became more involved in the Pueblo business community and took leadership positions both within and outside the automobile industry. Bill was chairman of the St Mary Corwin Hospital Foundation and soon after Barb chaired the Parkview Medical Center Board of Directors. Bill served on the Parish Council for Christ the King and Barb served on the YMCA board. At one point, both Bill and Barb were serving on the national and international automobile dealer boards, with Bill serving a term on NADA and Barb being elected as chairman of AIADA (American International Automobile Dealers Association). In 2004 the Vidmars joined an International group of pilgrims dedicated to provide schools for the people of the highlands in Guatemala. Since then they have made a yearly pilgrimage either separately or together and have helped build eight schools, and two libraries, under the umbrella of PAVA, a foundation created in 1983 to aid the Mayan people caught in the middle of civil unrest. From 2006 to 2009 Barb served on the Pueblo City Council and as one of seven like-minded members, worked to better our community and create a sense of place. The Vidmars believe in this community, love working with citizens from many backgrounds whether through the Pueblo Mountain Park (Bill), HARP Foundation (Bill), the CSU-P Foundation (Barb) or NADCharitable Trust (Barb), and continue their mission to promote Pueblo and make things happen. Barb has been accused at times of having “one good idea too many” and Bill believes whatever happens he “can handle it” so together they hope to continue to make a difference at home and abroad.